Hi! I hope you're enjoying the summer, Ireland is experiencing a heatwave at the moment, with temperatures of up to 30C (86F), that's pretty unusual for Ireland. I'm not a huge fan of the heat so I'll be happy when things cool down a bit! It's week two with our July muse Jocelyn Olson at CASE Study and I'm loving the inspiration Jocelyn is giving us. Just check out her card this week, a fabulous photo card. I loved the frame detail around the photo, the color combo and simple layout so I CASEd these elements. I definitely don't make enough photo cards and I know how much my family and friends would love them. There's nothing more special than a card with a photo of your loved ones as the focal point. I stamped the frame using one of the stamps from Sweet Memories (actually a Project Life stamp set) from The Craft's Meow and added my printed photo of my lovely Isabelle. 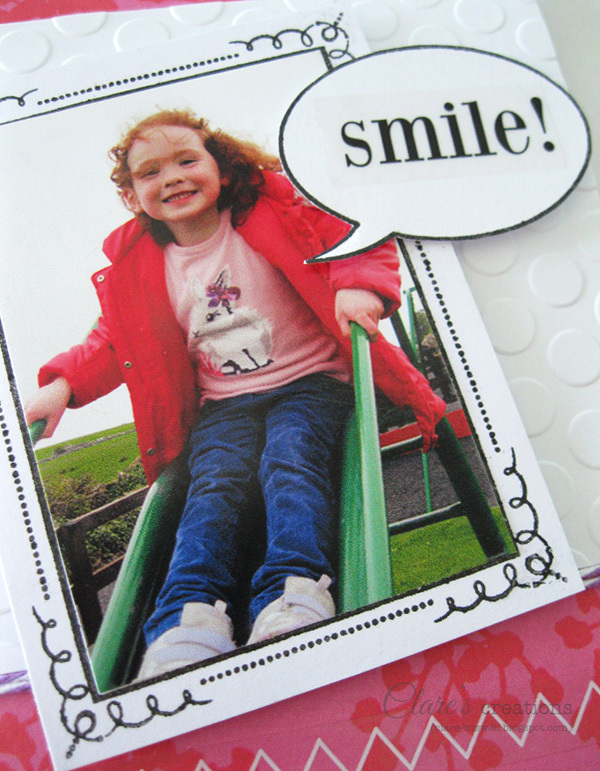 The speech bubble stamp is from Let's Face It also from The Craft's Meow. 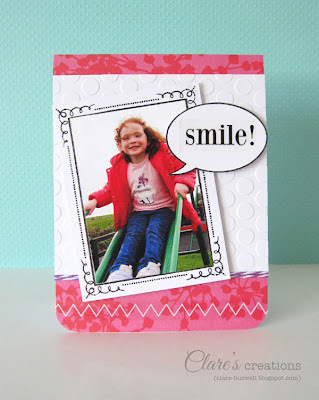 I added the 'Smile' sticker from Sticker Sentiments Life is Good from SRM Stickers, the zig zag sticker is from Sticker Stitches also from SRM Stickers. I hope you feel inspired to give a photo card a try if you haven't already! 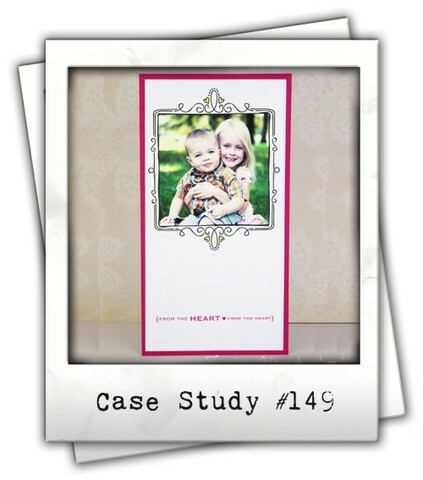 Don't forget to check out what my CASE Study team mates have created this week and our wonderful July Guest Designer Tracey McNeely! I've received stamps yesterday. It's perfect! Thank you! SUPAH!!! Georgeous FAB! Love the bright happiness of the colors. this oozes FUN! Love it! !